One thing that’s typically Japanese are the ridiculously clean cars. I have no idea how they manage to keep their cars that clean. It’s not like all the Japanese are collectively washing their cars on Sunday. In fact I hardly catch anyone cleaning their car ever. But somehow all the cars in Japan are sparkly clean. Maybe there are some car-cleaning-fairies that secretly clean all the Japanese cars at night and refuse to clean the gaijin cars. Whatever the reason, our car makes for a grim contrast with the Japanese cars. It’s almost getting to the point where it’s a little embarrassing (and yes, we have tried washing it but it just gets dirty very quickly again). You might think the above picture is not so bad. Indeed in Belgium there are lot’s of cars that are worse than that. But it’s the contrast that does us in. Have a look at the next picture. 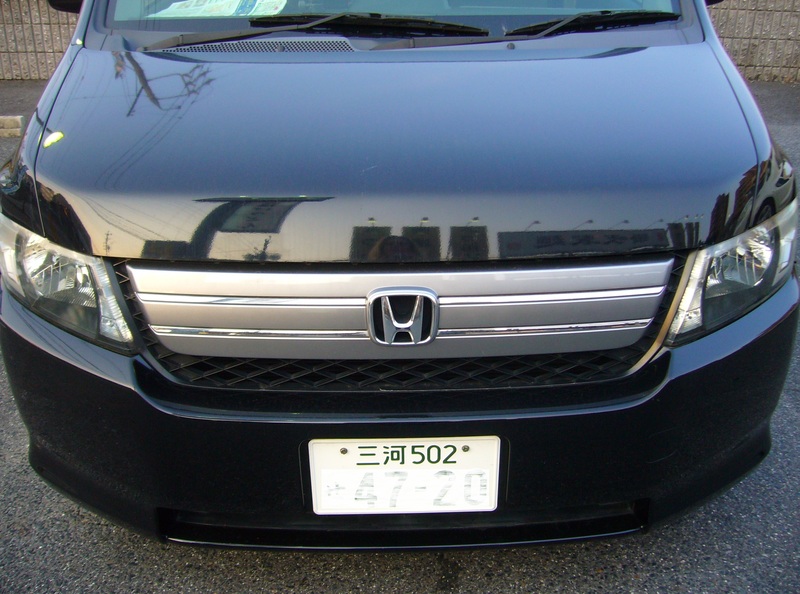 It is a very good example of a typical Japanese car. In fact this was just the car standing next to ours in the parking lot. It is so incredibly clean! And almost all the cars look like that in Japan. Amazing! This entry was posted in Japan and tagged Cars, Impressions of daily life, In the streets, Japanese culture, Strange Japanese things by Haruko-chan. Bookmark the permalink. 1. The products (chemicals, scents and tools) used to clean used cars INTERIORS before they are exported. Let me know if you need my email to send the info. Sorry can’t help you with that. 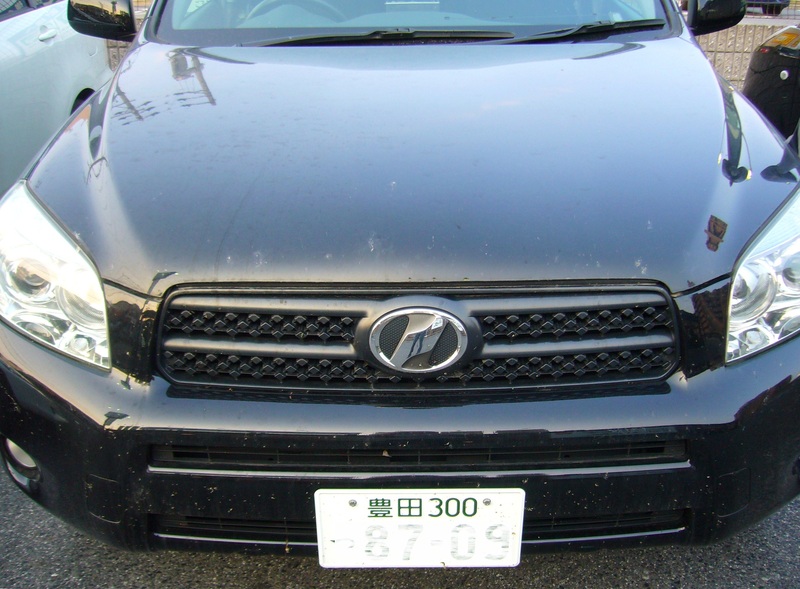 When I was live in Japan we actually did clean car every weekend! Fun! Did you clean it yourself? Or did you go to an automated car-wash? Yeah, I dunno! There are many magical things here that I haven’t quite figured out yet~~ But rest assured – there’s prolly a whole lot a work and sweat behind every presentation you see. Japan, the land of convenience… If you can think of it, it probably exists in Japan. The 100 yen shop is full of wonderful and amazing items! What’s your favourite magical item so far? I remember you blogging about that. I had never heard of it before that. If you see a car-cleaning fairy, please send her my way. My car is very unJapanese (while being a Toyota) and is marvelously dirty. I am always embarassed to go to some of the fancier shopping malls in central Tokyo when I have to machine park/pull out in front of a crowd. A friend told me today that it is possible to have a special coat applied when you buy the car, which helps to keep it clean. Of course you have to pay extra for that. Did you ever hear of that? I can imagine that. I know there is a coat you can get for your front window so that you almost never have to use wipers except in torrential rain. I’ve been in cabs like that.